Conor McGregor has been linked to some worrying claims in his home country of Ireland this week but how deep does his association with Irish gangsters go? There were some eyebrow-raising claims that UFC lightweight champion Conor McGregor was caught up in an altercation with a senior associate of an infamous Dublin gangster this week. Reports that McGregor had been involved in a barroom fight with a man believed to be the father of a well known Dublin criminal were ‘acknowledged’ by Police in the city. Rumors first linked a “well known Irish sports star” to an alleged assault in the Walkinstown area of South Dublin on Sunday night. Gardaí (the Irish Police) were reportedly informed of the incident yet to charges or complaints had been brought forward, according to Independent.ie. 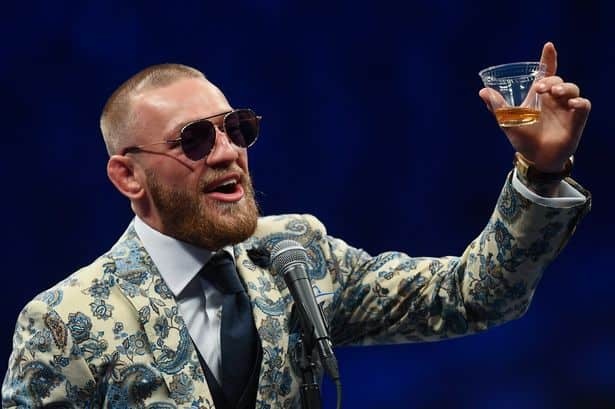 According to the initial report, a male in his 50’s with ‘close links’ to a well-known convicted drug dealer was struck twice by the man now believed to be McGregor. The man in question attempted to intervene when a man believed to be UFC lightweight champion Conor McGregor allegedly began to assault another younger male. The man in his 50’s was said to be ‘completely innocent’ with ‘no involvement in criminality’. Gardaí added that they believe the incident was ‘linked to another alleged assault carried out by the sports star earlier this month’. Further information was released which claimed that the older male McGregor had hit was the father of a man well known to police. That man is believed to be Graham ‘The Wig’ Whelan of Dublin’s infamous Kinahan cartel. Involved in a gangland war in the Irish capital city over the past few years, the gang have been linked to several murders and serious incidents by the Irish media. So who are the Kinahan Cartel and what association do they have to sports in Ireland? Well, some pretty established links, it would seem. In February 2016, a boxing weigh-in at the Regency Hotel in Dublin, Ireland, was the scene of a bloody murder. Five gunmen disguised as police officers broke into a boxing weigh in with assault rifles before unleashing shots into the crowd, with men, women and children present. Alleged Kinahan enforcer David Byrne was murdered in a revenge hit by the rival Hutch gang following the death of a relation to their boss in Spain. What followed was an all-out gangland feud between the Hutch and Kinahan groups which escalated to the point of several murders. The nephew of Hutch leader “The Monk”, Gary Hutch, was murdered in 2015 by the Kinahan Cartel reportedly for being a police informant. “The Monk” hit back by arranging an attack at the boxing weigh-in which led to the Kinahans hitting back again with response to Byrne’s death. The Kinahans are believed to have ordered a total of nine assassinations, decimating Hutch’s power in the city. The scenes at the boxing weigh-in at the Regency Hotel led to the Irish media exposing links between Irish mobsters and sports stars in the country. Over a period of weeks, hits were being carried out in Dublin while its inhabitants looked on anxiously. Jamie Kavanagh was the Irish boxer set to fight for a European title when the boxing weigh-in was stormed by mobsters. His father, Gerard “Hatchet” Kavanagh, was an infamous notorious gangster who many believe was murdered by the Kinahan’s cartel despite at one time being a high ranking member of the organization. Kavanagh’s younger brother, Paul, was also believed to be murdered by the Kinahans.